Venkat Ranjan is crowned winner of the National Geographic Bee, Anoushka Buddhikot is in second place, and third place finisher is Vishal Sareddy. Winners of the 2018 National Geographic Bee, from right to left: Venkat Ranjan, 13 of California, the champion; Anoushka Buddhikot, 13, of New Jersey in second place; and Vishal Sareddy, 14, of Georgia in third position. 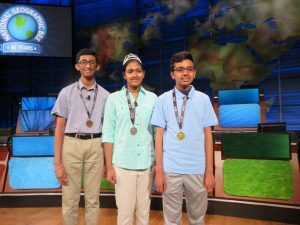 WASHINGTON, D.C. – Indian American whiz kids made a clean sweep at the 30th annual National Geographic Bee competition winning the top three awards and, barring two, all the finalists, 80 percent, were of Indian origin. For the seventh consecutive year, an Indian American kid, Venkat Ranjan, 13, of California was crowned winner of the prestigious competition. In second place was Anoushka Buddhikot, 13, of New Jersey, and the third place finisher was Vishal Sareddy, 14, of Georgia. The winners were awarded one of three college scholarships totaling $85,000 at the end of an informative, ever so engrossing contest, held at the National Geographic headquarters in the nation’s capital. Ranjan secured the top award of $50,000, the title of National Geographic Bee Champion, a lifetime membership in the National Geographic Society, including a subscription to the National Geographic magazine, and an all-expenses-paid expedition to the Galapago Islands aboard the National Geographic Endeavour II. Buddhikot and Sareddy received $25,000 and $10,000, respectively. Following the preliminary round which was held on Monday, each of the top ten winners was awarded $500. Upon winning the competition, he confessed to not knowing the answer to the final question and arrived at it by eliminating other options such as Brazil and Argentina. How does it feel to be crowned the champion, we asked. “I feel good, great,” he replied. “Not nervous any more,” he added unlike on Monday when he got the very first question wrong in the preliminary round. Ranjan started seriously preparing for the competition three years ago. This was the first time he was competing at the national level and he won. He is a bright, brilliant student in eighth grade at the Windemere Ranch Middle School, San Ramon, where he heads back on Friday for the remainder of his final exams. 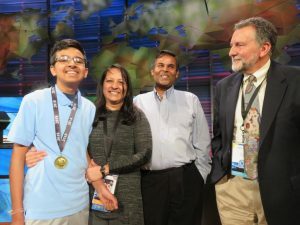 Venkat Ranjan, 13, of California was named champ of the 2018 National Geographic Bee. He is seen here with his parents — mother Chinmayee Raman and father Amiya Ranjan. Buddhikot, who is in eighth grade at Bridgewater-Raritan Middle School, says history is her favorite subject. “I think it’s interesting to learn from the past and be able to bring that back to our future,” she said. About preparing for the National Geographic Bee, she mentioned studying for hours every day, especially over summer and the holidays, ever since she was in fourth grade. Sareddy, in eighth grade at Riverwatch Middle School, Suwanee, was a returning contestant at the national level. “On stage, you have to be calm. You can’t be stressed or nervous or even over-excited. That can really hurt your performance in the Bee,” he said. Sareddy started preparing for the competition from first grade and more seriously from the fourth grade onwards. Given that geography has been his passion ever since he was a child, he would like to pursue a career in that field and cited possible options such as a National Geographic explorer, an international economist, marine biologist, or an archaeologist. In school, his favorite subject is social studies, and in his spare time, he likes to play the violin, basketball, runs cross-country, and loves to travel. It is noteworthy that the original pool of Geography Bee participants comprised 2.6 million students from over 10,000 schools in all 50 US states, the District of Columbia, Union Territories and Department of Defense Dependents Schools. A total of 54 state bee winners, 16 of Indian origin, who participated in the preliminary were selected from a pool of over 4,600 students in grades four through eight. The figures are staggering when one considers that out of this original pool of millions, only 10 advanced to the Championship round and eighty percent of the finalists were of Indian origin in a country where Indian-Americans comprise one percent of the population. The competition, also known as the Nat Geo Bee, is an annual geography contest open to students ages 10 to 14, organized by the National Geographic Society. It is tough and challenging, but also entertaining and very impressive! The aim is to inspire and reward children for their knowledge and curiosity about the world. The competition has been held every year since 1989 and in recent times, Indian American kids have been crowned winners. Pranay Varada, 14, of Texas was crowned champion of the 2017 National Geographic Bee. A year earlier, Indian American kids aced the competition with Rishi Nair, 12, of Florida bagging first place, followed by Saketh Jonnalagadda, 14, of Massachusetts and Kapil Nathan, 12, of Alabama in second and third place, respectively. Among other recent national champions are Karan Menon of New Jersey (2015), Akhil Rekulapelli of Virginia (2014), Sathwik Karnik of Massachusetts (2013) and Rahul Nagvekar of Texas (2012). The 10 finalists who competed in the 2018 National Spelling Bee were: Gayatri Kaimal, 13, of Arizona, in seventh grade at Basis Tucson North, Tucson; Atreya Mallanna of Massachusetts, in fifth grade at Joseph Estabrook Elementary School, Lexington; Saket Pochiraju of Ohio, a returning contestant, in eighth grade at Orange Middle School, Lewis Center; Ashwin Sivakumar of Oregon, a returning contestant, in eighth grade at Oregon Episcopal School, Portland; Nihar Janga of Texas, 2016 Scripps National Spelling Bee co-champ, now in seventh grade at Canyon Ridge Middle School, Austin; Sean Cheng, in eighth grade at Cooperative Middle School, Stratham, New Hampshire; Jonathan Song, in eighth grade at Salem Middle School, Apex, North Carolina; and the top three winners.